I was hoping to be much farther along with this than I was (read: finished) but got stuck on one or two things. Here is the WIP for Scramble for the 7800. I am about half-way through with it. Looks amazing, as usual. Plus, I am impressed by the speed of getting this one out. I haven't tried it yet, but I imagine that if you have collision detection done, that would have been very difficult to implement. For your questions, re: joystick button, would it be possible to have an option for both? 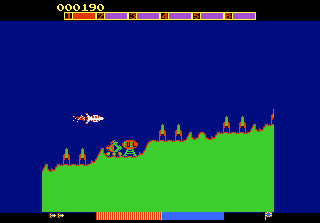 I've played versions of Xevious where bomb/shoot are tied together, and ones where they're not-- I think sometimes you can set it on the main menu or difficulty switch. I think if it's an on-screen option, it'll give people the ability to play the way they're most comfortable. My hat is off to you, again. You are the very best bob!!! Happy New Year! Can I be first on the pre-order list? Bob, incredible and amazing as always. Thank you for sharing it with the communuity. I cannot answer question 1. For question 2, in harmony with a purer arcade experience I recommend the buttons separate. However, perhaps an A-B switch feature is in order here. If the switch is on the A-side buttons are independent, if it is on the B-side then either button fires both weapons. Edited by Trebor, Sun Jan 1, 2012 9:22 AM. I am on hollidays at the moment.Sorry for the late comments,but my internet connection is really bad,here in thailand. Great work Bob,as used.You are the best.Sure,you can count me in for a cart. To progress into the later difficulties it becomes vital to time your bombs seperately from your guns. It isn't a deal breaker for me, but maybe a one/two button option on the title screen similar to the way a typical 7800 game lets you choose difficulty or number of players. Either way put me down for one! I can't wait to advance into the scramble system again. You are a freaking mazing! Oh man, this looks awesome. 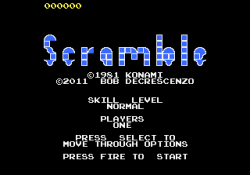 I played plenty of Scramble as a kid growing up (we had the cocktail table and upright frequently) and love it to this day. 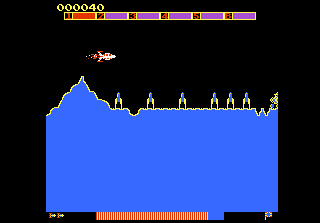 Regarding the missiles and bombs, yeah, I agree it would be nice to have a choice to have them linked or separated for the 7800 version. Difficulty DOES ramp up big time after you destroy the base. Screen comes at you faster and more rockets launch up for sure. 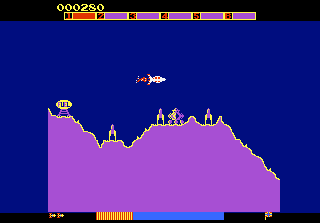 Interestingly, Scramble was ported to the Vectex, but I do not believe any of the other consoles pre-crash (C64 though - granted not a console). However, Super Cobra saw an extensive release on nearly every platform, and I remember the numerous ads in comic books for the game. If anyone with a little more knowledge or insight could perhaps add to the thought or share, is Super Huey to Scramble, what Galaga is to Galaxian? Sorry Bob, not meaning to derail this thread. 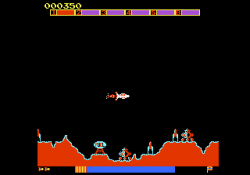 When I first saw your post I was thinking this was the game which was extensively released to all the other platforms, and then realized that it was not. It triggered the plethora of thoughts and ideas above. Regardless, awesome and fantastic work. It is greatly appreciated. Edited by Trebor, Sun Jan 1, 2012 9:33 AM. Your games never cease to amaze me! Maybe some system could be devised for 1-button setup. e.g. hold button gives firing, quick press/release gives bomb. 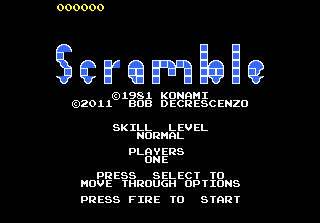 I have always loved Scramble!!! wow Bob comes through again. Yes the bomb and fire need to be seperate. As others suggested, make it an option to use one or two button play with the default being two buttons. 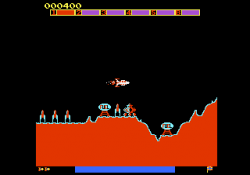 I fear that you'll be scorned for releasing Scramble for use with one button only by purists and we've seen how Super Cobra on the 2600 panned out. I was just playing a Scramble arcade cabinet last night and on the fireball stages I like to take a break and just drop bombs to rest my fingers. 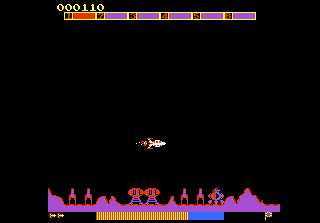 With a one button only option, you may find that firing missiles during this stage may be distracting to players. I'll fire this up in emulation later. As usual - put me in on the pre-order list! Great start to a classic game! Please add me to the pre-order list! Very nice. I'll want one once it's ready. If there is a pre-order list, then please add me also. You are the man, again, Bob. Please put me down for a cart. 2 button separation is always better IMO. Awesome! Great way to start the New Year! Thank you! And do add me to the cart list when you have it ready! Thanks for the encouragement guys, and the kind words. Ok, selectable it is. I will use the difficulty switch to go between one and two-button joysticks. P.S. - I still need to get more eproms and cart cases to be able to make carts here just yet (especially cart cases). I figure I have time because I still have a bit of work to do on this. I have some Pole Position II carts if it would help!